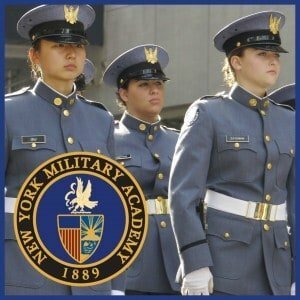 The New York Military Academy has been a co-educational campus since 1975. We actively outreach to exceptional, young women to join our Corps of Cadets because of our commitment to modeling an environment for female leaders to thrive. NYMA has an excellent track record of training and educating such leaders. The majority of our current faculty is female including our Superintendent and Dean of Academics. As a result, we mirror this inclusive environment across our Corps of Cadets and ensure our students are learning from effective powers of example. We believe NYMA is an ideal place for young females to grow and develop and we take this responsibility very seriously. As a military school with strong athletic resources, we provide the perfect setting for young women to nurture their athletic talents. We promote and maintain a culture that focuses on developing such ideals as character, cooperation, and compassion. NYMA feels this development philosophy enables our cadets to flourish and grow across their own lines of interest free from traditional pressures. Merit-based scholarships are available for female cadets; please visit our growing campus and find out more!